Indeed, I am totally taken with Starbucks Casa Miranda's architecture with its stunning woodwork. It's most dominent when you enter by the door in Calle Las Lonjas. 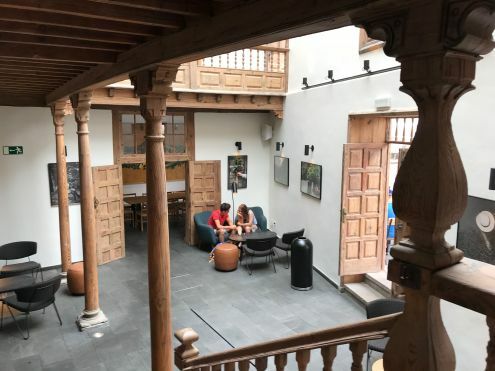 Starbucks Casa Miranda entrance hall patio i.e. atrium with its three wooden TEA galleries and staircase. Two young people are sitting in a corner. 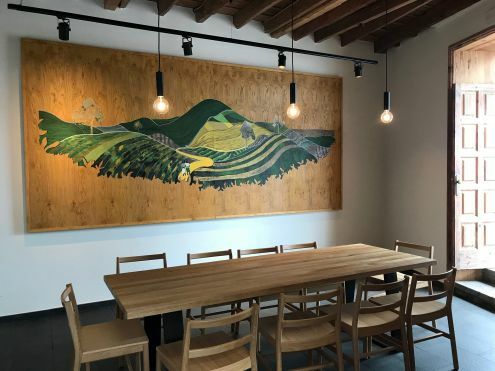 A large double door opens to a large group table with a modern wall hanging behind it. I must confess that I didn't sample any of it so far at this revolutionary, new Cafeteria of Puerto de la Cruz. In fact, its menu seems to be rather tempting. I have seen one of its breakfast cereals. It doesn't only look heathy but also delicious. The so called menu Picnic that's displayed by one of its entrances warrants testing. Besides, Coffee that is Arabica based made Starbucks famous all over the world. 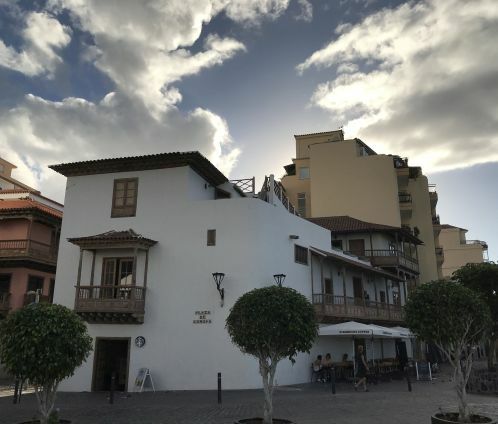 Where is this fabulous Starbucks outlet people have started to talk about in the oldest resort of this biggest Canary Island? Its TEA is of such good quality that it was worth restoring. TEA is endemic Tenerife Pine. 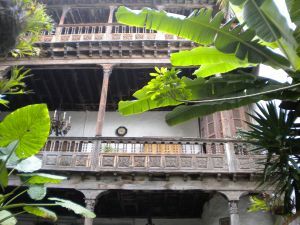 Casa Miranda's which was built in 1730 may be as ancient as that of the Casa de los Balcones whose timber came from demolished mansions in the XVIII century. The firm BF Medifictoria who brought back the timber splendor is said to have removed the old varnish of the TEA with beach sand. Casa Miranda new main drawing room upstairs with amazing flow. The flow seems to run all along the facade of the building in Calle Santo Domingo. There is an opening to a room extention with a balcony that shows to the Town Hall on Plaza Europa. An almost formal and symmetrical composition when you return to the main room from the attached chamber that faces the Town Hall. 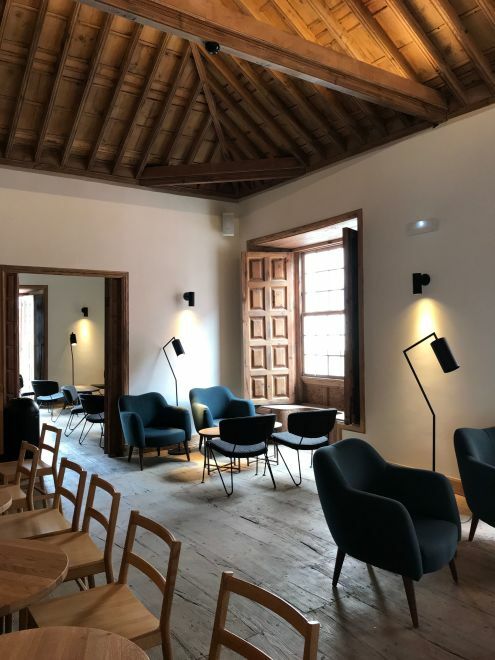 The word chamber rings a bell for the remodelled Casa Miranda for Chamber music, such as at the Casa Grande of Abaco of Puerto de la Cruz? Besides, it could also accommodate yearly receptions like that of the German Carnival delegation from Düsseldorf. 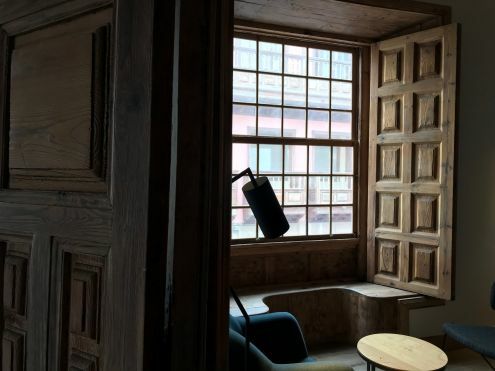 A romantic nook by a latticed tall window with its opened timber shutters inside. Light from outside casts a magic shine. The furniture on both ground- and first floor of the building is kept to a minimum. Both very large tables and small round ones look like made of light timber. A few upright lamps have been skilfully placed. Very few side boards are seen. 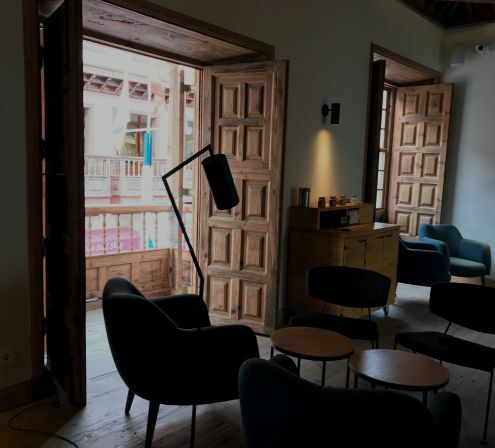 Casa Miranda 2018 with borrowed feature with pastel colors from street scene outside, while the blue easychairs remind the Fifties furniture style. 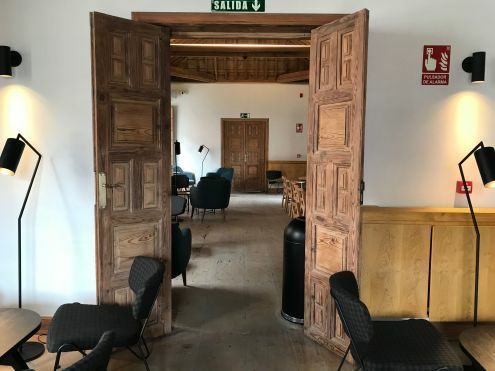 The bulk of the Starbucks furniture in Puerto de la Cruz matches the color of all Casa Miranda woodcraft of doors, windows, pillars, balconies and staircase. 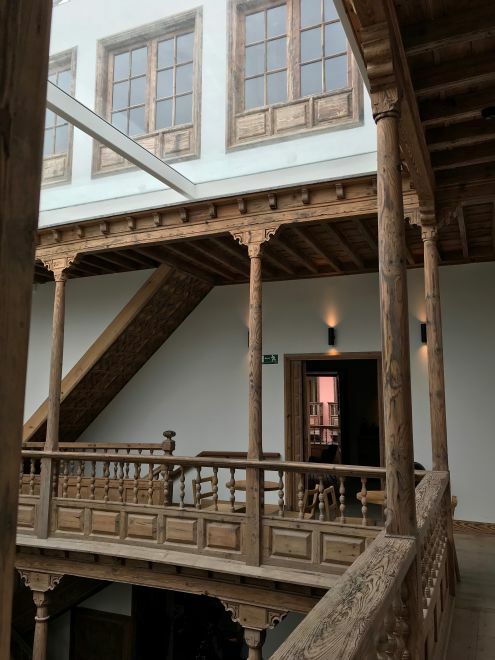 Virgin TEA timber balconies carried by slender wooden pillars, some of which delicately carved, make up the galleries on the Casa Miranda first floor and create natural ventilation. Only the wooden ceilings have darker tones. The classic timber armchairs don't look rural. Obviously everything at Casa Miranda echoes an upper class. 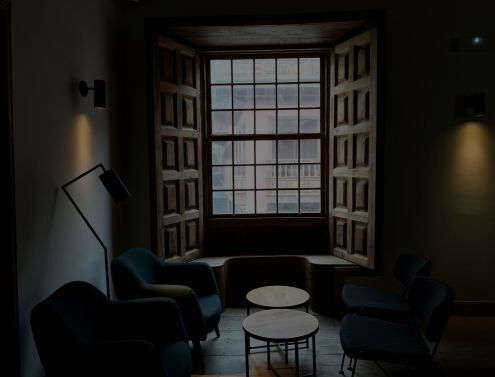 Opened inside TEA shutters lend their own architectural charm. What's missing besides green at Starbucks in Puerto Cruz? The Tenerife holiday home insider still would like to add some vital photos of the mansion's views as well as pictures of the restaurant's food and drink. Some tall, plants in the entrance Patio would set some amazing contrast. You see those with Casa de los Balcones of la Orotava portrayed beside.